Northeastern Technical College's Career Connect is a program designed to get you the workforce training you need to start a new career. All programs are short-term, can be completed in less than two semesters, and give you the marketable skills to land your BIG Job FAST! Career Connect programs are all college credit classes, which allows you to apply the certification and credits you earn towards additional credentials, such as an Associate Degree. The programs offered are also eligible for Financial Aid and other grant funding. The staff at Northeastern Technical College is committed to YOUR SUCCESS, so reach out to us if you have any questions. We will walk you through the process, so you can achieve your goals. 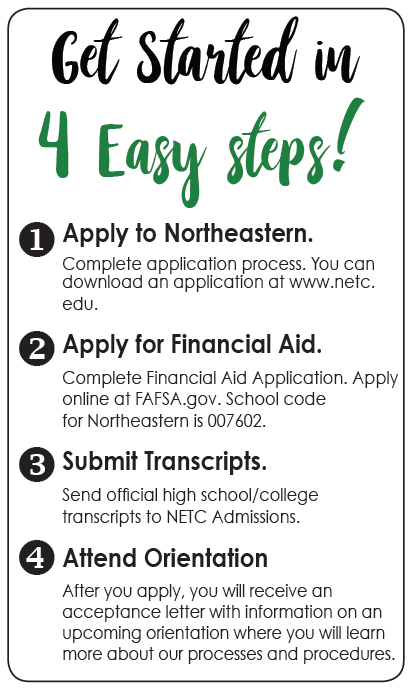 Complete your Free Application for Federal Student Aid (FAFSA). Use school code 007602.